I often get asked by other women what type of mascara I use. Having extra-long eyelashes, I have trouble finding a mascara that doesn't leave me looking like Rocky the Raccoon. Last December we were in Miami for a family wedding and I had to run to Ulta to grab a new mascara. 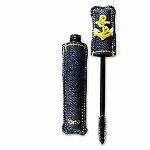 The sales associate recommended Tarte's Lights Camera Splashes Natural Waterproof Mascara. This is by far the absolute best mascara that I have ever used. Weddings, Bikram Yoga, Maryland humidity, and swimming pools are no match for this mascara. You'll definitely want to get a good eye make up remover because it is difficult to get off with just a normal cleanser and water. The sales associate also recommended this product because it is botanical and does not contain harsh chemicals found in other waterproof mascaras. Click here for ingredients.